SearchHomesNW | Seattle-Ballard Real Estate-Easily search all Ballard homes and condos for sale. Ballard is a small water-centric community bordering Puget Sound and Salmon Bay that was annexed into Seattle in the early 1900s. Ballard is characterized by manufacturing, commercial fishing, and recreational boating. It is home to many industrial businesses and continues to be known for its fishing fleet. The area’s vibrant commercial district is packed with excellent dining options, popular bars, local boutiques, and music venues. Real estate options in the Ballard neighborhood include brand new condos for sale and smaller single-family homes on cozy streets. 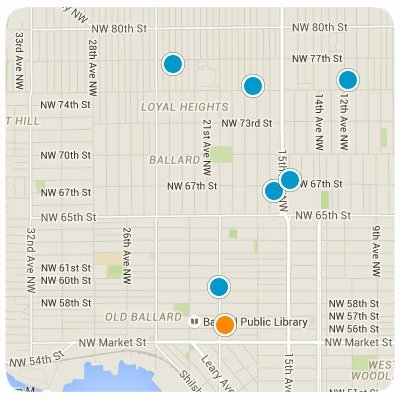 Homes for sale in Ballard vary: there are Condos For Sale In Ballard, Town-Homes For Sale In Ballard, and Single-Family Homes For Sale In Ballard. There are also many New Homes For Sale In Ballard or under construction. Thank you for using SearchHomesNW.com to find 30% more listings than Zillow, Trulia, and Realtor.